DETAIL--FIRST EN RADA BAR, UPPER THIRD. Not indicated by any of its markings are its dimensions (approx. 6.2” long X 1.1” wide X 0.3” thick) and its weight, which is recorded as one pound, five ounces (Mathewson). I assume this to be U. S. weight in consideration of the approximate volume of the bar. So, it must weigh 21 ounces (U. S.) X 1.215 (conversion factor) = 25.5 troy ounces. At a  market price of $450 per ounce, the bar’s “melt” value would be $11,475. Because of its fineness as an artifact, and because there are so few of these in existence, I would assign it a historical multiplier of 5X to 10X (see PLVS VLTRA Newsletter, 1st Quarter, 1988), which means that it would have a “historic value” of between $57,375 and $114, 750! Boldly impressed on top of one of the “royal stamps” is a curious cartouche containing what appears to be six block letters. 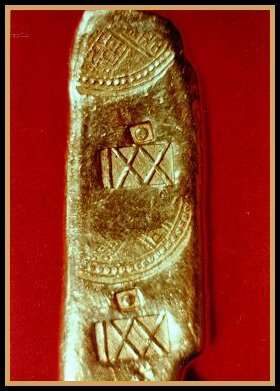 At first glance, the letters seem to spell EN RADA in Spanish, hence the nickname for this ingot of gold: “the EN RADA bar.” Because the lettering was conspicuously different from what had been seen on other bars found up to that time, the moniker stuck. Eugene Lyon briefly mentioned in his book that La Rada was the area of an inner harbor at Cartagena (Colombia). In Spanish, that would be interpreted as “the anchorage”—too generic a term to be a pronouncement on a gold bar. Closer examination of the marking reveals that EN RADA is actually a Spanish monogram containing at least nine different letters. Then they must spell something more than EN RADA! Last year , Dr. Lyon and I discussed the cartouche in light of its being a monogram, and we postulated that it could stand for NUEVA GRANADA, possibly indicating the mint or mine in Colombia at which the bar was produced. I later had to discount this possibility for the lack of a “G” in the design.